Danish director Susanne Bier has made a career of heightened but poignant drama that depicts broken relationships, familial tensions and personal catastrophes. One of her last films, Love Is All You Need (2013), was just that. They tend to be the kinds of films that are heartrending and raw if you have bought into them, but can feel trite and overwrought if not. 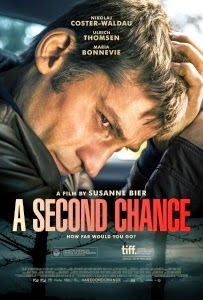 Sadly her latest, A Second Chance (En chance til, 2014), which hits UK cinema screens this week, falls firmly into the second of those camps. It features probably the most extreme situation that she has tackled yet, and unfortunately, in forging forward with its unconvincing premise it lacks the authentic foundation upon which to build the emotional turmoil. Game of Thrones star Nikolaj Coster-Waldau makes his first appearance in a Bier film as Andreas, a provincial detective with a loving wife, Anne (Maria Bonnevie), and a bright-eyed baby boy. A sensitive new father, he is shaken up one day when he and his partner pay a visit to a familiar ex-con, Tristan (Nikolaj Lie Kaas). Previously convicted of domestic violence and a known junkie, Andreas is appalled to learn that Tristan and his girlfriend, Sanne (May Andersen), have had a baby which lies covered in its own faeces in the squalor of their apartment. He can’t shake his concern for the infant and his agitated state affects his judgement when tragedy strikes, leading him to embark on a drastic, immoral – and honestly ludicrous – course of action. From its opening title montage, this is a world of exaggerated scenarios. Golden light floods into Andreas’ apartment as he and his wife cradle their newborn. In contrast, Tristan and Sanne are the polar opposite; poster children for lost and drug-addled souls. Covered in tattoos, Tristan is a caricature who actively forces Sanne to neglect their helpless baby son. Despite the typically handheld camerawork, nothing feels especially credible at this stage and that sense is only compounded when Anne is revealed as a short-tempered wild-eyed wreck even before the shocks of the plot are unleashed upon her. Of course, all of these things are there to set the scene for what is to follow and particular elements make more sense with hindsight, but at the time, they appear overcooked and sometimes plain misjudged. This means that as the stakes are raised and the fairly strong performance appropriately increase in pitch, things appear histrionic and the narrative twists fail to hold any weight. There is a tender story about paternal love and the desire to do right by one’s family within A Second Chance but, regrettably, Bier’s brand of melodrama derails it before it begins.